Hi! It’s Amy from Hertoolbelt! I hope you all are having a wonderful Christmas season. This summer I made a patriotic Americana Door hanger, and loved the look of the ‘sewn’ star. Then while flipping through the Christmas Pottery Barn kids magazine, I saw their rustic star ornaments…and knew it was time to make some more stars! The star pattern includes 2 sizes of stars. 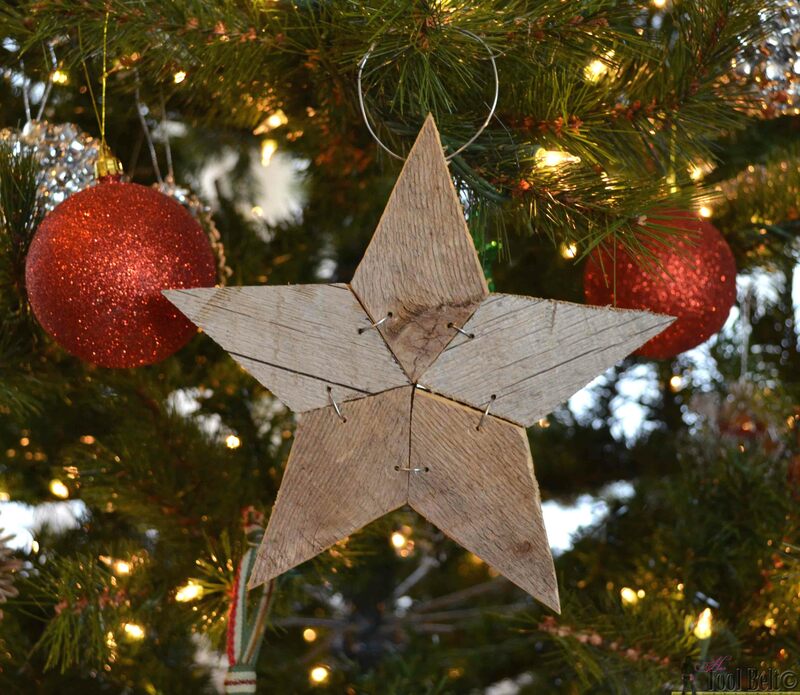 The large star is about 13 1/2″ wide, the small star is about 7 1/2″ wide. Print out the Patchwork star pattern, when printing make sure your print settings are on 100%, not ‘fit to page‘. Cut out the diamond pattern(s). 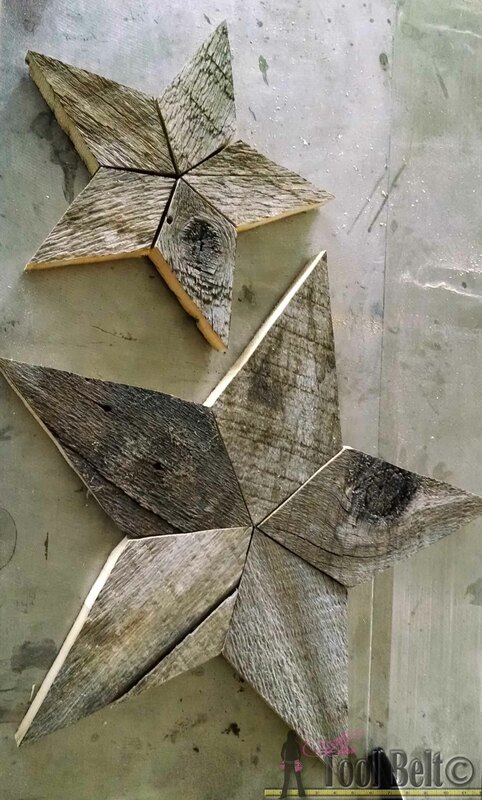 Trace 5 diamonds on a piece of wood for each star that you’d like to make. 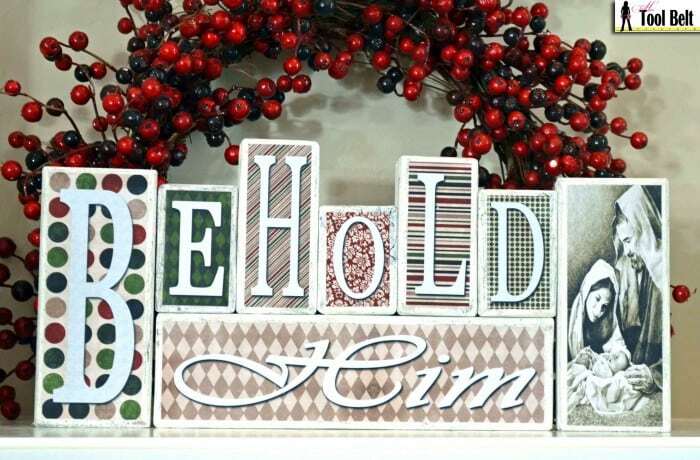 Use a jig saw, band saw, scroll saw or even a hand saw to cut out the diamonds. I love working with weathered wood. Look at all of that natural character! The gauge (size) of the wire used to tie the star pieces together isn’t very important. Grab a drill bit that is slightly larger than the size of wire. Drill adjacent holes for each joint. I only made one set of holes, you may want to add a second set of holes closer to the center. Thread the wire through the adjacent holes and twist it together tightly. Repeat for each set of holes. 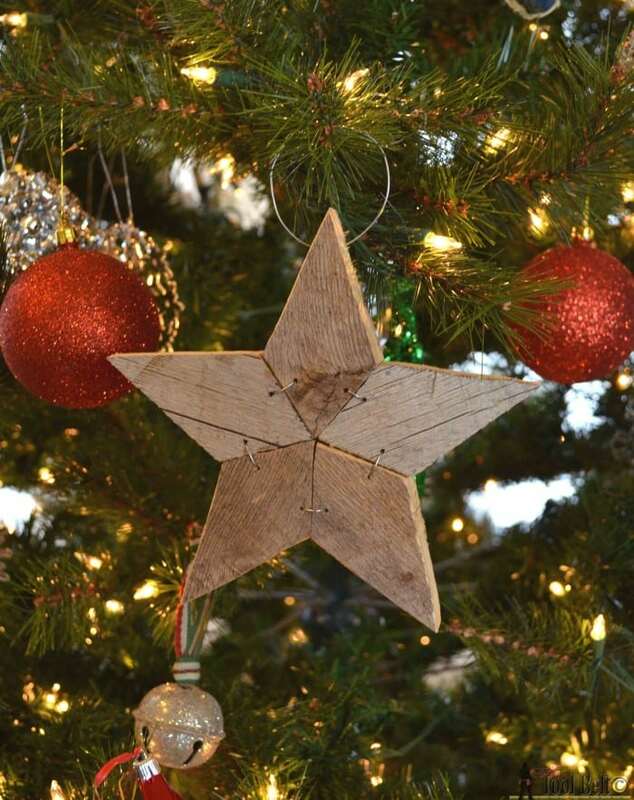 To make the rustic stars an ornament, drill a hole through the top of one of the star points and add a loop of wire. 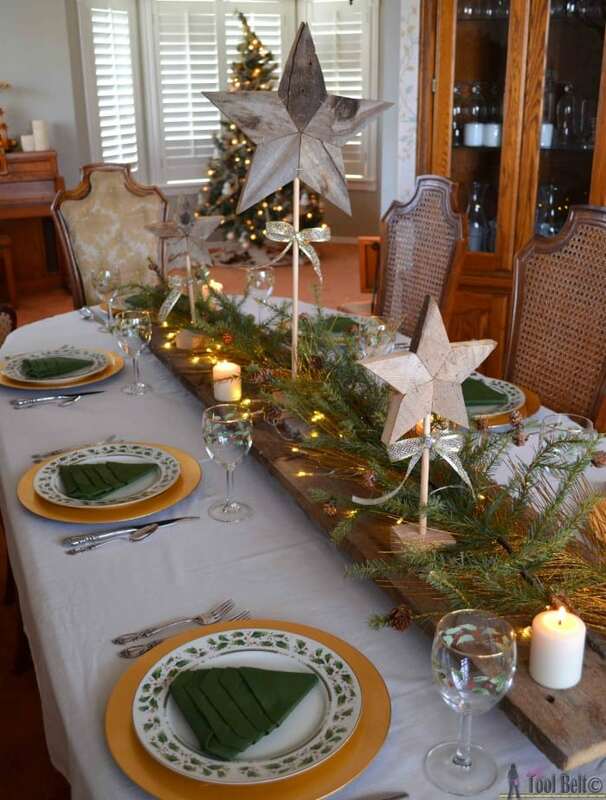 I wanted to make some of the rustic stars free standing, for a table decoration. I drilled a 3/8″ hole about 1″ deep through the bottom of the star. Cut a piece of 3/8″ dowel according to the height you need. Cut a small piece of 2″ x 4″ wood and drill a 3/8″ hole. Place the dowel in the wood block and star. Add a bow if you’d like. 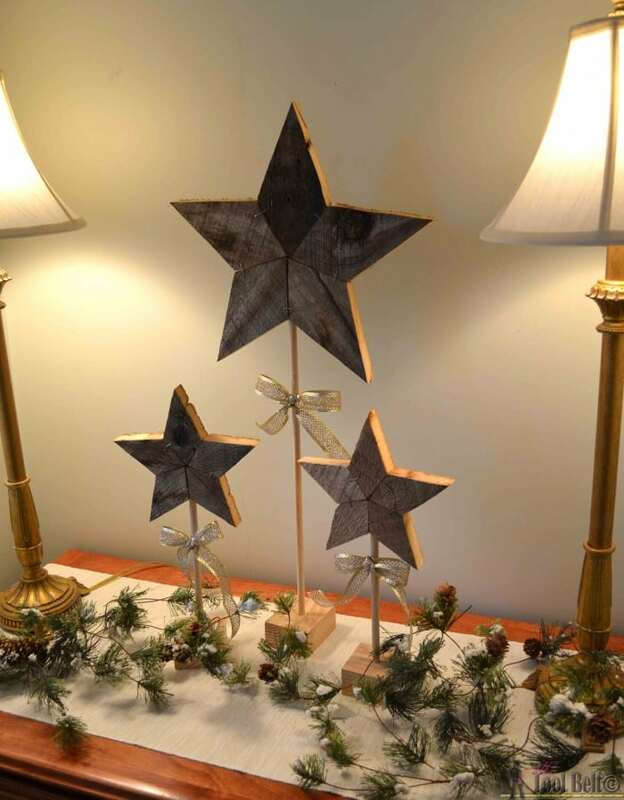 The stars also make a cute vignette, or they can be used as a backdrop for your nativity set. 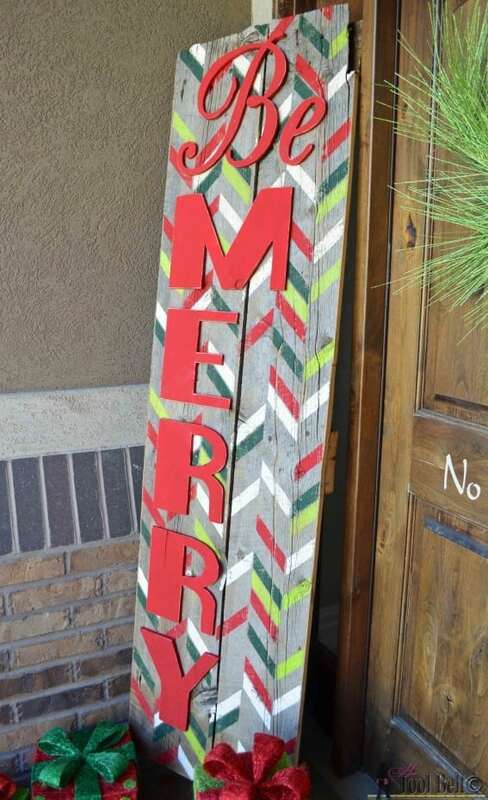 Thank you for a wonderful and fairly easy way to use up all those precious small pieces of barnwood. And thank you for sharing your template. Your idea is so cute! I do have a question for you. I would like to get a Cricut, hopefully from Santa, but I don’t know what model to request. I’ve never worked with anything like that before so I could truly be called a novice. Your thoughts and ideas would be appreciated. Do you have any tips for placement of the templates to avoid wasting wood? I’m just now learning how to use some of our woodworking tools (compound saw, band saw & scroll saw) & this has been a great project but it seems like there should be a way to stagger the templates to avoid having to make three cuts for each section. 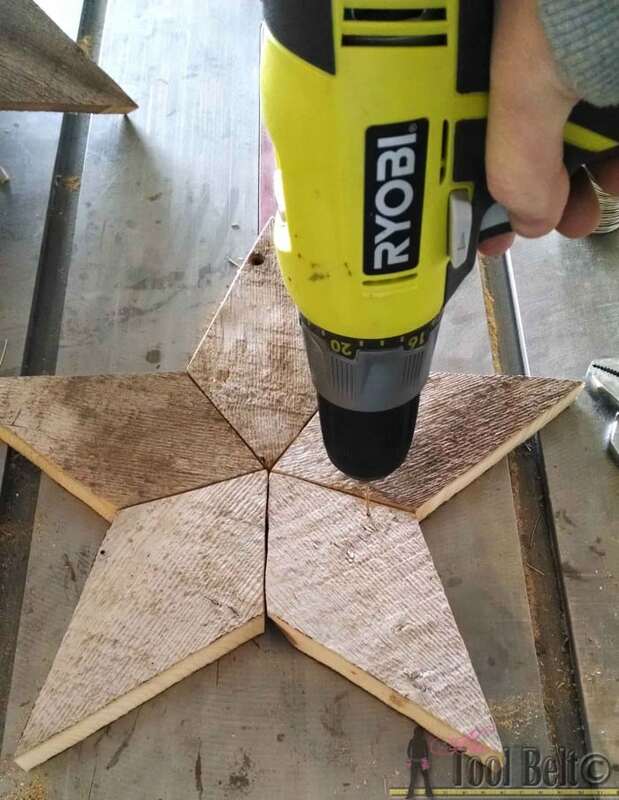 I made one of the large stars from pallet wood & the inner sides matched up well. The small star was a bit more difficult but it looks OK after I shaved a tiny bit off where some of the edges meet. Thanks for sharing your star DIY, especially the stencils. I’m going to be doing these tomorrow. Thank you for sharing the pattern, have you tried just gluing the pieces together opposed to staples? I will try this today. I am trying to find a template for the Texas star you show here. Can you help me find one?